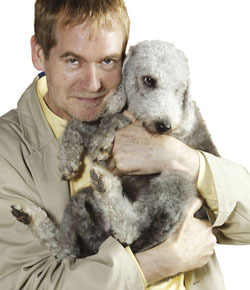 While loved Ashleigh and Pudsey on Britain's Got Talent (which was on ITV) - we hated Keith Lemon's LemonAid appearing to give a Pug away as a prize to children (also on ITV). And it was the recent LemonAid shocker that made me recall a previous ITV animal disaster programme Super Tiny Animals which showed just before Christmas and was full of 'iccle this and that and was glorifying Teacup dogs and tiny endangered monkeys... and a whole host of very mutant animals without any sense of outrage. It was horribly irresponsible TV and at the time all the charities plus the BVA and KC were Super Huge Upset by it and were pretty much shunned by a petulant ITV who didn't seem to ever put their hands up and say sorry. Certainly not publicly. But we had hoped they'd at least listened. Last night I was sent a press release inviting me to tell others about an event that was being filmed for ... SUPER TINY ANIMALS! If you want to know what all the fuss was about with the last one... here is the link to the blog. As you can see everyone tried to make it less damaging, there was a united affront! But did they listen or even respond? No. So what do we do this time? They're obviously not going to pull it, they're already well underway. But can we influence the content subtly? We're not against small dogs, far from it. Beautiful Bonnie was on our December front cover and Mr Hudson, a Boston terrier, has just joined our office staff. What we need is for people to small dogs as dogs and not things. The depiction of small dogs as fashionable handbag accessories and impulse purchases that you can dress up really is hugely irresponsible. Can we show them that small dogs are living breathing sentient beings? Show them some examples of small dog brilliance that covertly shows the viewer that they are getting so much more than a fully toy? Anyone got any other bright ideas? They really need to address the health concerns with breeding for ever smaller dogs - last time that American pet shop owner saying the Teacup Chihuahuas she was selling from glass fronted boxes was a particularly healthy one as it only had a tiny bit of water on the brain.... ugh. 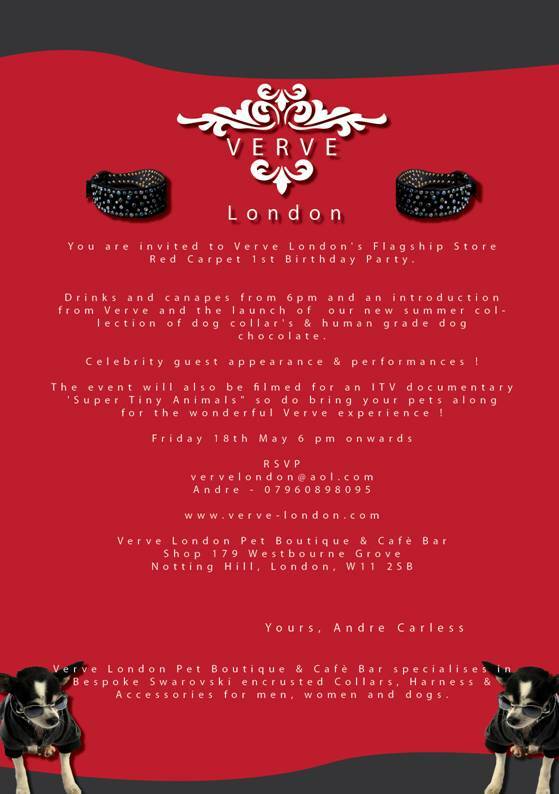 Here's the invite to the event that is being filmed - if you have a small dog that isn't just 'arm candy' perhaps you'd like to attend and show and tell what your small dogs can really do? Any small dogs with jobs? Let me know what your little dog can do. Any small dogs that can dance? Any tiny dogs doing agility or obedience? Any small dogs that have had health problems because of their size? Any small dogs that have been rehomed due to them being given up after a young owner got bored of them? 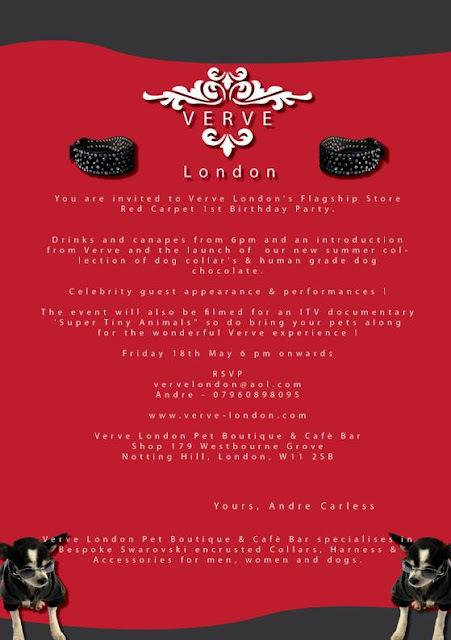 Verve London’s Flagship Store Red Carpet 1st Birthday Party. Friday 18th May – 6pm onwards. Drinks and canapés from 6pm and an introduction from Verve featuring the launch of our new summer collection of dog collars and human-grade dog chocolates. Celebrity guest appearances and performances. so bring your pets along for the wonderful Verve experience. Of course all the charities and the KC and BVA need to get back in touch with both ITV and the ITV studios who seem to be making this documentary and urge them to be a LOT MORE responsible this time. Here's what the ITV website says about the previous programme. You can see why they want to do it again. It was VERY popular with young people, I think we could tell that from the way Twitter lit up with young people wanting a tiny donkey or an 'iccle piglet or a teacup dog for Xmas. "This slot-winning documentary performed extremely well on ITV1 in November 2011 achieving a 22% share. With 5.2 million viewers, Super Tiny Animals performed above the slot average in terms of viewer volume and performed fantastically with younger audiences gaining 35% on the slot average for 16-24 year olds and a 24% gain for 16-34 year olds." 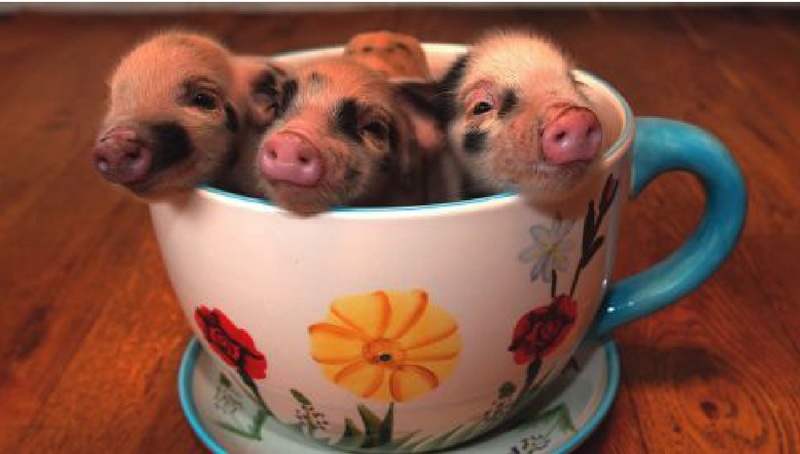 From tea-cup chihuahuas to miniature pigs, the demand for mini-pets is growing but is it a lucrative business or a cruel genetic mutation? This documentary goes behind the scenes of what is fast becoming a multi-million pound industry. Candid interviews with breeders and owners reveal the extent of the demand which now extends to supplying tiny cows, pigs, rabbits, horses and even goats. Probing and insightful, Super Tiny Animals is a compelling look into a world of incessant human intervention. Let's have a brainstorm, what can we do to stop ITV's next episode just portraying small dogs as a must have fashion accessory. Anyone got any anecdotes as to how more small dogs ended up in rescue after this first documentary was shown? Is there a standard approach to complaining about something we've seen on television which upsets us? Facebook groups etc are all very well, but they are preaching to the converted. 4) If such a thing exists, sign the relevant petition, which can be used to show depth of feeling and the numbers of people concerned. I hope that's correct. If there's any other avenues which can be pursued to get this (and any other upsetting television coverage) off the air, do please let me know! Papillons are regularly stars at agility, and there are many toy dogs working as service and therapy dogs. I know of at least one case of a Papillon ending up in breed rescue after being bought by a teenager, and kept caged in the garden after she lost interest. We have a team of pugs who are training and competing in agility, or our own version Pugility, and one who does some HTM - here is a video of a training session for Britians Got Talent audition: http://www.youtube.com/watch?v=o4skDPFERH4 We have pugs in the team aged from 1 up to 8 years old, all fit and healthy, some faster than others! Certainly not "handbag" dogs, and not what many expect from pugs. Happy to demonstrate what pugs can do.